Rice and shine - Can white rice cause diabetes? Rice and shine! A recent article published in the British Journal of Medicine may be a wake up call on the effects of high consumption of carbohydrates on health and disease. This time it is not about simple, processed carbohydrates but complex carbohydrates in the form of starch. Hopefully these new scientific data will help us better understand the role of carbohydrates in the development of obesity, diabetes and heart disease. It will certainly help us realize that it is not all about cholesterol and fats. The article presents results from a scientific study performed by Emily A Hu and coworkers at the Department of Nutrition, Harvard School of Public Health addressing the effect of white rice consumption on the risk of type 2 diabetes. Type 2 diabetes is a metabolic disorder that affects adults and is characterized by high blood sugar levels and insulin resistance. It used to be called adult onset diabetes. Type 2 diabetes makes up about 90% of cases of diabetes, the rest being due to diabetes mellitus type 1, which usually affects younger people. Common symptoms of type 2 diabetes are fatigue, excess thirst and frequent urination. Often people with type 2 diabetes have no symptoms. However, diabetes affects most of the organs in the body, the heart, arteries, kidneys and nervous system. The disease severely increases the risk of heart disease, coronary artery disease and other serious cardiovascular disorders. 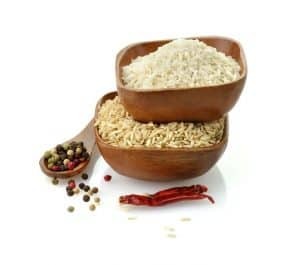 Rice is grown world wide and provides food for a large part of the worlds´s population, mainly in largely populated countries like China, India and Japan. White rice is the predominant type of rice consumed worldwide. It consists mainly of starch and is produced through a series of mechanised processes including hulling and milling. The glycemic index of white rice is generally higher than that of whole grains. Therefore white rice contributes highly to the glycemic load among populations with high consumption of this type of food. It is known from previous scientific studies that diets with high glycemic index or glycemic load are associated with increased risk of diabetes. The scientists at the Harvard School of Public Health performed a so-called metaanalysis on all published prospective cohort studies evaluating white rice intake and incidence of type 2 diabetes. They also quantified dose-response relations between intake of white rice and type 2 diabetes in order to find out whether the magnitude of white rice consumption was important. Four studies met the inclusion criteria and were included in the analysis. The study population consisted of 352.384 individuals. Among those, 13.284 developed diabetes during a follow up period from 4 – 22 years. Two studies were done in Asian populations (China and Japan) and the other two studies in Western populations (the United States and Australia). There was a huge difference between the average rice intake in these countries. In the Chinese study the average consumption of cooked rice was four servings (625 g) per day whereas in the studies done in the United States and Australia participants consumed less than five servings a week. The results of this study showed that higher white rice consumption was associated with a significantly elevated risk of type 2 diabetes. This association seemed to be stronger for Asian than Western population. It is known that among Asian populations white rice consumption is the main contributor to glycemic load. This may be one of the mechanisms contributing to the increased risk of diabetes. Other factors may however play a role as well. Compared with minimally processed whole grains such as brown rice, white rice has a lower content of many nutrients including insoluble fiber, magnesium, vitamins, lignans, phytoestrogens and physic acid, which are lost during the refining process. Some of these nutrients, such as fiber and magnesium, have indeed been associated with a lower risk of type 2 diabetes. Hu and coworkers point out that data on the association between brown rice intake and type 2 diabetes are limited. There are however small studies indicating that the substitution of brown rice or other whole grains for white rice may lower the risk of diabetes. However more studies are needed to answer this question. Authoritative organizations have for the last two decades put huge emphasis on reducing fat consumption, mainly the consumption of saturated fats. This may indeedhave diverged our attention from the important role of many other nutrients such as carbohydrates, proteins, antioxidants, vitamins and minerals. Furthermore, the message to reduce dietary fat may have stimulated manufacturers and consumers to select foods that are potentially harmful. This may indeed have contributed to the current obesity epidemic in western societies. The study by Hu and coworkers is certainly a reminder that we have to broaden our understanding on the effects of different nutrients on health and disease. The public person is usually very interested in selecting foods that promote health. There is huge information flowing through the internet on dietary recommendations. Unfortunately, much of it is unreliable and not based on scientific evidence. It is the role of specialists on health and nutrition to relay sensible, understandable and correct information to the public. Avoiding over-consumption of white rice, or even more simply, selecting whole corn alternatives like brown rice may indeed be a step towards better health.